Simba Arati: MP Simba Aratis' home undersiege, Police camped at Simba Aratis' home in Kileleshwa. - Bana Kenya News, Real African Network Tubanane. Home featured News Simba Arati: MP Simba Aratis' home undersiege, Police camped at Simba Aratis' home in Kileleshwa. 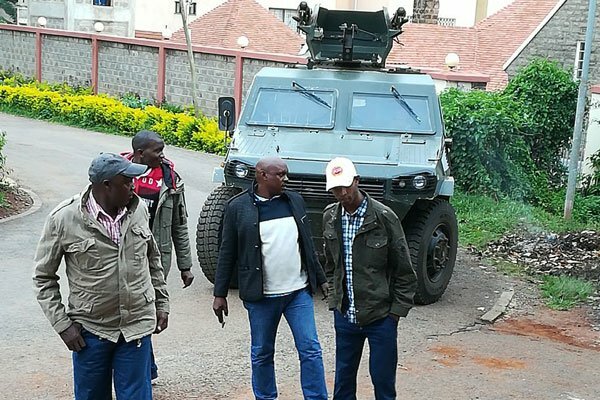 Simba Arati: MP Simba Aratis' home undersiege, Police camped at Simba Aratis' home in Kileleshwa. MP Simba Arati is under house arrest. The home to the vocal NASA legislature is under siege as police from different units surrounded his home inspection all cars coming in and out of the villa. Dagoretti North MP Simba Arati’s home in Kileleshwa has been surrounded since 6.00 Am today. The MP was shocked to the contingent of Police surrounded his home with armored vehicles. “We are planning prayers for our supporters who were shot dead during protests. We will also fundraise for the victims’ families so that they can hold a befitting send-off for their loved ones,” he said. “I’m not aware of any operation in the MPs home,” Mr. NPB Japhet Koome said. “I am the mobilizer for Jacaranda meeting so I think this is related. They know if my supporters learn of the siege there will be a problem so that’s why they have brought the armored car. “They can see my cars inside and so they know I’m inside,” said Mr. Arati. The MP said he was in the dark on the reasoning behind the siege but guessed it could be because of his role in the organization of the Nasa rally at Jacaranda. He was expected to attend the Jacaranda rally as he was one of the Mobilisers. The police officers said they will not leave the home until the swearing ceremony at Kasarani is completed.